﻿There are officially 16 more days until the first day of Spring! In Pittsburgh though, it seems that the weather has already started to become less wintry. Today it is supposed to reach a high of 52 degrees and tomorrow 51 degrees. This is absolutely fabulous! I will repress the fact that when I went to check the weather the headline on weather.com was NEXT POTENTIAL BLIZZARD and that in 1993 Pittsburgh received a total of 24.6 inches of snow on March 12 and 13. Instead I will simply focus this weekend's lovely forecast. Each Spring for the past three years Anthony and I have traveled to Washington D.C. to visit our dear friend Michael who is at Catholic University studying to become a priest. We have been fortunate enough to time our visit around the cherry blossoms. With milder weather just in general, it is always such a treat to travel to D.C. and escape some of the greyness and chill of Pittsburgh. Michael does a fabulous job playing tour guide to us and taking us to all of the wonderful spots in D.C. for eating, drinking, and general sightseeing. So far the blossoms have cooperated with our travel schedule and have been in bloom when we visited. I diligently check the Bloom Watch which charts and predicts each phase of the bloom process. Unfortunately, last year my friend Steph ventured to D.C. only to find what she described as a "Stick Festival" since all of the blooms had fallen early. 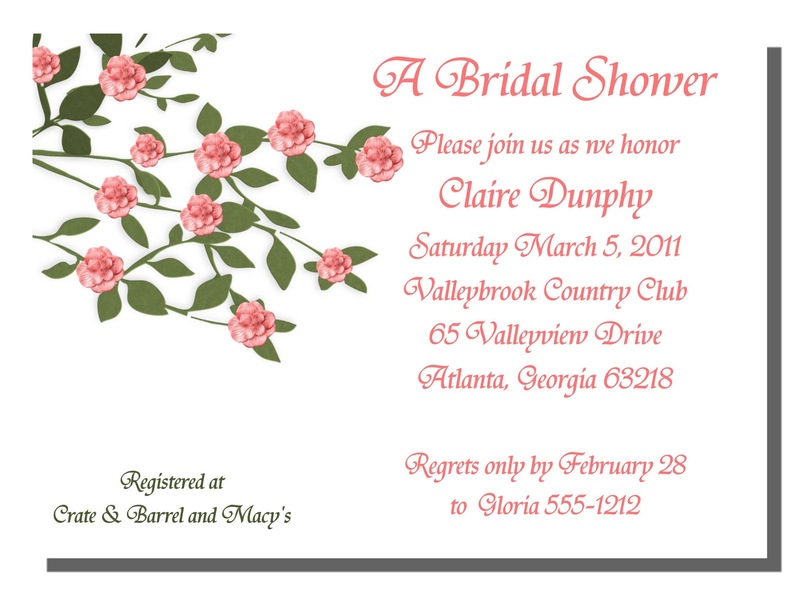 With the lovely wedding pictures as inspiration, I made these bridal shower invitations. I just love how pink they are. 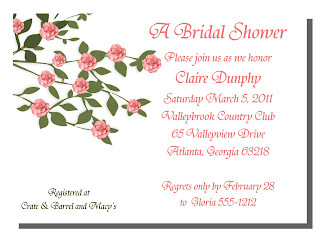 You will find much more elaborate Cherry Blossom invitations on Etsy, but I just wanted to focus on the blossoms--obviously the main attraction. After our first visit to D.C. to adore the blossoms, I really wanted a memento of the beautiful blooms to keep in our house. At the time, I had to settle for a print from Art.com, but now Etsy is absolutely filled with cherry blossom items that I wanted to share with you. I am thinking that I will be purchasing some of these. I just have to decide what and how many. I don't want people thinking that I am obsessed with cherry blossoms (even though I am slightly). To see more of Nancy's work or to purchase these paintings visit her shop. I found these lovely paintings by Nancy Jean at thePaintedSky. In her shop she features breathtaking paintings that truly capture the beauty of nature with an aura of warmth about them. In Asian Inspired Love, the nest and the butterfly just bring such optimism to the piece and with its simplicity it is positively stunning. Her other cherry blossom painting, entitled Love Song, is equally charming with its two lovebirds. 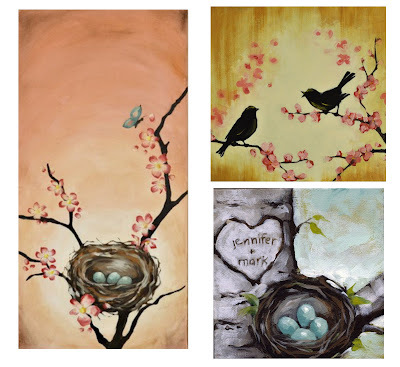 I would be remiss if I didn't mention that she also does custom pieces and I must admit that I am very drawn to the Custom Love Nest Painting too. Perhaps because it already has my name on it--but who is this Mark guy? Is he interested in a cherry blossom themed wedding? In all seriousness though, despite the fact that there are so many artists on Etsy, it is truly rare to find one who offers paintings, not prints, for a reasonable price, but Nancy manages to do it. ﻿﻿﻿﻿﻿﻿﻿﻿At Whitefish Style they have captured the beauty of cherry blossoms on both a screen-printed tank top and tunic. A family business, based in Whitefish Montana, Scott's shop has many lovely items that are inspired by nature.They are also environmentally responsible and use nature friendly water based inks and "especially love to use organic cotton and/or garments produced with wind and solar power." Offering tanks, tees (for men and women), dresses, hoodies and jackets, Whitefish Style creates the perfect balance of casual beauty. I must admit that although I am very partial to the cherry blossom styles, the owl tees are also fabulous. One of the perks of ordering from Whitefish Style is that they do FREE shipping to the U.S. and Canada--how wonderful is that? Visit the shop to deck yourself out Whitefish Style. I also found the perfect cuff bracelet to complement Whitefish Style. Actually, I found three of them. Alyssa at theshagbag creates some truly splendid cuff bracelets, earrings, and necklaces with lovely florals and a nod to Asian design. Based in Portland, Oregon she creates unique bracelets that seem to make everyone pause and adore them. Part of their lure is in the polymer clay that she uses to create these amazing designs. I am especially fond of the "jade" bracelet that even takes on some of jade's translucence. She even creates coordinating earrings to complete the look. Some of the wonderful things about her shop include that she offers discounts through facebook, she includes a perfectly sized box for gift-giving, and she will do custom orders to accommodate any sized wrist. She also offers a deal if you purchase four bracelets at once--come on friends let's get together on this one. When we visit D.C. we spend most of the day out and about and rarely return to the hotel room, so I am always in need of a great bag to hold all of our goodies and faithonearth has the perfect one! Sheliah creates these lovely handmade bags and matching wallets without a pattern! She is so crafty and talented that it is all in her head. The bag measures 11" high by 14" wide. The handles measure 27" from end to end and is secured with a magnetic snap closure. 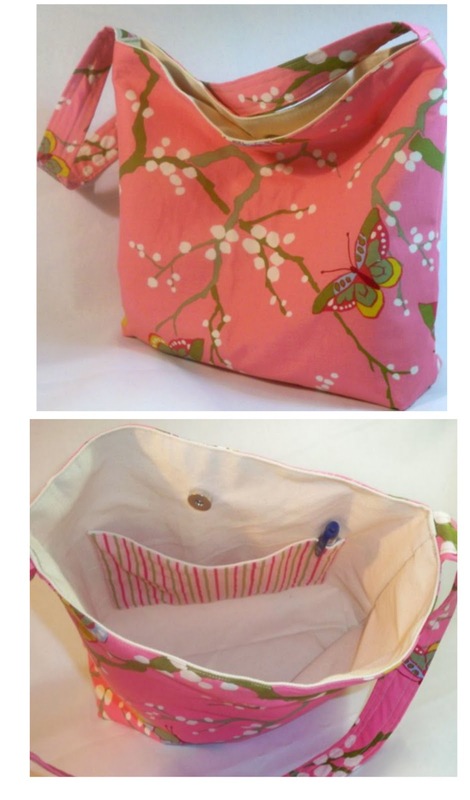 I am in love with the cheery pink fabric and the whimsy of the butterflies. In Sheliah's shop she has chosen many whimsical fabrics that really bring lots of variety and fun to the typical tote bag. This bag will be ideal for for the camera, souvenirs, some sandwiches, and some fruit especially for my fruit-a-holic husband. Finally, last week I featured the wonderful Sock Monkey dog harness by Terrier Trousers and so I felt compelled this week to find a cherry blossom collar so that even my wiener dogs could participate, even though they will not be joining us on the trip. I found this lovely collar from k-9closet for them to wear. It is just perfect with the blue background and the pretty pink blossoms. Notice the pink satin inside for some extra fanciness. They even offer an upgrade to a swarovski crystal buckle---ohhh the possibilities! Perhaps that is why their phone number is 1-877-DivaPet. 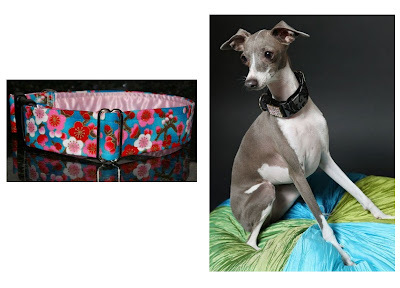 I happen to know of a few Italian Greyhound owners who might be interested in this and, as luck may have it, k-9closet even has this picture of an Italian Greyhound wearing the bling encrusted collar. I think they might also be interested in the fluffy cushion that the dog is perched on too! I suspect my silly wiener dogs aren't sophisticated enough for the sparkling upgrade because they have been known to conspire and chew each other's collars off. Visit k9closet to buy only the finest collars for you pooch.